Apparently, 2013 was my year to lose really big fish. I had hooked and lost three Steelhead in the upper teens. Then in a five day period I hooked and lost three over twenty pounds. The smallest of these three took a piece of pink yarn I was drifting through and behind some big boulders only a few feet from the riverbank. The fish immediately came completely out of the water right in front of me and then proceeded to take over one hundred yards of line/backing without a hesitation. It then came up out of the water, threw the hook, and left. We had a really good look at the fish and it appeared to be easily twenty pounds. The second largest fish took a purple Pick ‘Yer Pocket well out away from the traveling lane used by most of the Steelhead and silvers that were coming past us. This fish started by taking a large amount of line going downriver but it then turned back upriver. When it was straight out from all of us it came completely out of the water – not jumping, but swimming – remaining level to the water and sliding back into the water. When it again turned back downriver we followed it a long way down the riverbank before I brought it into the shallow water. It was right up to the net when it erupted once more throwing the hook and leaving. Kalum River Lodge’s guide with the net estimated it, as we all did, at slightly better than twenty-five pounds. Interestingly, two days later another angler at the lodge who was fishing with another group hooked and landed a fish in the same area and it looked exactly like the one I had lost at the net two days before. It was an unusual fish in that the girth of the fish was huge compared to the length. He landed the fish after about twenty minutes without the fish making even one good run and it was obvious that the fish had been tired out previously. That fish measured at twenty-five and a half pounds. I strongly suspect that it was the same fish that I had to the net two days earlier, as its length and depth appeared to be identical to the one we had seen come out of the water just a couple of days earlier. The biggest fish was a truly memorable fish. A twenty pound Steelhead fresh from the salt is generally considered a “fish of a lifetime” by most fishermen. A thirty pound plus Steelhead is in a completely separate league, as I was about to find out. I was experimenting with a “Dean River Tiger” fly and casting out a bit further than normal. The fish took the fly shortly after it hit the water. The fly was out quite a bit further when it was taken than what seemed to be the traveling lane for most of the fish and even though there was fifteen feet of T-17 pulling the fly toward the rocks it was not in the water long enough for the fly to sink more than a foot or so. The fish erupted out of the water and headed downriver. It made a series of long runs and each time it began a new run the reel handle spun so fast I didn’t have time to get my left hand out of the way. After several of these runs I became aware that my hand was getting beat up. (Later that day, I noticed that much of my hand was black and blue!). Watching the reel go from stationary to spinning wildly, my thought was that it was like having an electric motor hooked up to it and having the switch going back and forth between “on” and “off.” Each turn of the reel meant that over a foot of line went out and when the switch turned “on” the reel handle looked like a blur. It finally began a long run. My rod was bent and pointing straight downriver when I caught sight of something out of the corner of my eye out in the middle of the river. At this point, going by where my backing changed color, I figured that I had at least three hundred yards of line out downriver but the fish was surfacing straight out from us in the middle of the river and heading the opposite way. All of us watched it as it surfaced. It swam completely out of the water and then slid back into the river still swimming at an unbelievable speed up the fast Skeena. As the fish again turned downriver I recovered as much line as I could and started the trip down the riverbank, all the while reeling in line whenever I could. It was a long trip down the gravel bar but I finally worked the fish into the shallow water and up to the net of the waiting guide. He slipped the fish into the net but as he later said to Andrew [Andrew Rushton, Owner/Head Guide of Kalum River Lodge] “My net just wasn’t big enough for the fish”. The head of the fish stuck out above the net and with one last explosion the fish threw the hook and into the river it went. The guide had only a couple of weeks before landed a Steelhead that measured over twenty-five pounds and when he talked to Andrew, he said that this fish was clearly bigger. He referred to it as a “monster.” He was a veteran guide of many years on prime Steelhead waters and he was not known for exaggeration. In the twenty-some years of being in business, Andrew referred to this fish as definitely “one of Kalum River Lodge’s biggest Steelhead”. As I said in the beginning of this account – this apparently was my year to lose really big fish. I visited with my good friend from BC. If he was described as an avid Steelheader, it would be a gross understatement. He agreed that Steelhead fishing is both the most frustrating fishing we have ever done and by far the most exciting fishing we have ever done. 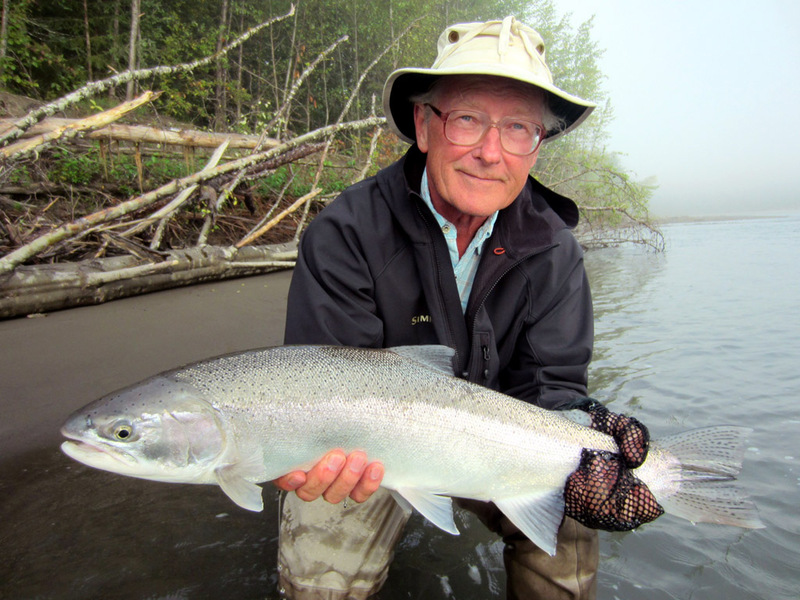 He related how, when he first started, that he was puzzled by the terms “rising a fish” and “takes” and “hook-ups.” He wondered why Steelheaders didn’t simply talk about fish landed. After a short while, he said, it became obvious to him. Steelhead fishing appears to be a fever and there appears to be no cure. I’ll probably continue to go back north to Steelhead rivers until I can no longer stand in the current and cast.